We are a CFO (Cottage Food Operation), home based (for now) bakery. We are mainly at farmers markets. We pride ourselves in bringing you the best artisan breads we possible can. Visit us Sundays 9:00 am- 1:00 pm at the Canyon Lake Certified Farmers Market. We will be expanding soon. Locations will be added as soon as we know the locations. We are a family owned bakery. The owner is by profession a clinical social worker who has had a love affair with bread and pastries. And that is what he brings to you every Sunday, passion and love for bread. The owner, Mr. Sam Espinoza, wanted to start a bakery right after high school. He went to learn abroad with his uncles who had been baking since before they were ten years old. Fate had other plans though. He "fell in love", and decided to hang out with "the love of his life." (Gladly he found the love of life 18 years later) But the passion for bread still remained in him. He attempted to learn on his own, and asked his mother, who had a catering business in Mexico City. However, Sam began a career in psychology, and later pursued a graduate degree in social work from the University of Southern California. As time went by the itch to bake became unbearable, and eventually began to look at culinary programs, and asking dear ol' mom for advise about starting a restaurant/bakery. Sam finally began his quest, after taking out a book from the public library about sourdough breads. He began to follow the recipes, and eventually cultivated his own sourdough starters, which he now uses on all his breads. He also began asking family members who own their own bakery in Mexico City and Cuernavaca for advise and guidance in bread making. He began selling sourdough breads and pastries to school staff where he frequented clients. 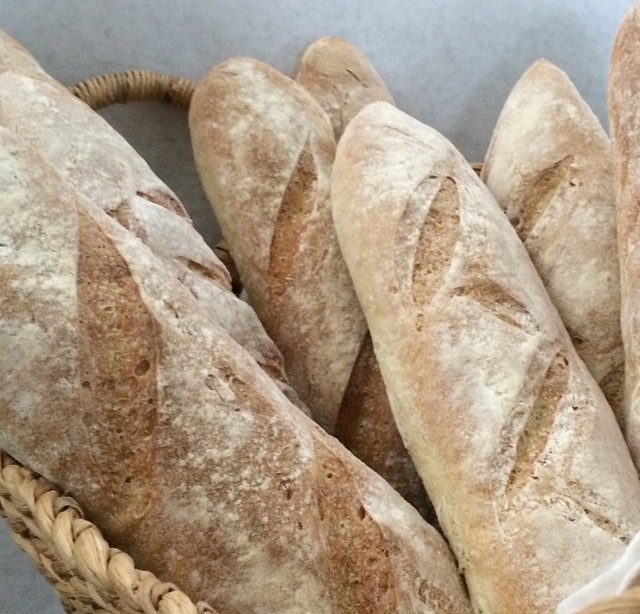 For two years now, Sam has been perfecting his breads to be able to bring you quality bread.